Virginians pay high power bills largely because the state’s regulatory system is “rigged,” in favor of energy companies, according to Clean Virginia, an advocacy group seeking reforms. The group notes on its website that the state’s two dominant power companies - Dominion Energy and Appalachian Power Co., who, together provide 82 percent of Virginia’s power and have contributed $12 million to state candidates since 1996 - have had a major role in writing the laws that regulate them. 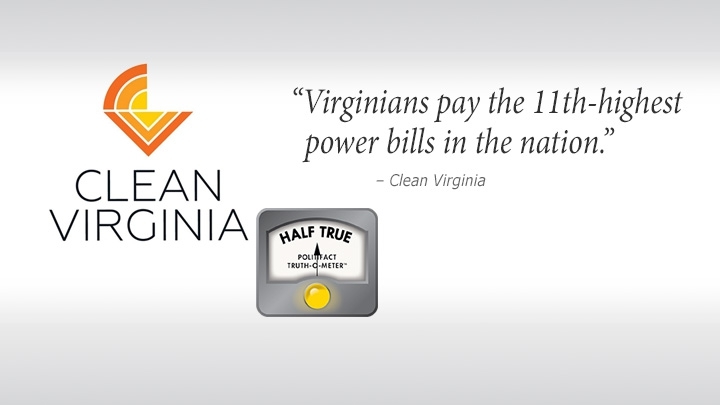 As a result, “Virginians pay the 11th-highest power bills in the nation,” Clean Virginia says. Brennan Gilmore, executive director of the group, referred us to data on residential power use collected by the U.S. Energy Information Administration. They show that Virginians received an average residential electric bill of $124.54 a month in 2017. That, indeed, was the 11th-highest tab among all states and the District of Columbia. But there’s a caveat that Clean Virginia’s website omits. Power bills are generally tallied by multiplying two figures: the cost rate for a kilowatt of energy per hour times the number of kilowatt hours used. Virginia’s average residential rate of 11.55-cents per kilowatt hour is the 17th-lowest in the nation. Conversely, its average household use of 1,078 kilowatt hours a month is the eighth highest. In other words, the driving force behind high residential bills in Virginia is not the rate; it’s the heavy use of electricity. EIA charts show a similar pattern across the nation. Households in states where power is relatively inexpensive usually consume more electricity than those in expensive states. Virginians, for example, use more than twice the power consumed by households in Vermont and Hawaii, which pay some of the highest rates in the nation. When the EIA divides states into 10 national regions, the ranking of areas by residential rates is the exact opposite of their ranking by usage. Generally, the highest rates are in the coldest regions. We asked David Jonas, policy director for Clean Virginia, if he agreed that Virginia’s high electric bills are driven by high consumption. “Certainly, you’re right to point to that,” he said. Jonas added that Dominion could push its residential rates lower by streamlining operations. He pointed to a 2017 study by the American Council for an Energy-Efficient Economy, a Washington research group. It ranked Dominion’s efficiency policies 50th among the nation’s 51 largest power companies. The hefty bills are not caused by high electricity rates, which are established in negotiations between power companies, regulators, state politicians and other parties. To the contrary, Virginia has the 17th-lowest residential rates. What’s driving the big bills is the high consumption of electricity by Virginia households who, on average, use the eighth-most power in the country. That follows a pattern across the U.S.; states with low residential rates use a lot of electricity and vice versa. Clean Virginia told half the story, and we rate their statement Half True. Clean Virginia, website, accessed Nov. 16, 2018. Virginia Public Access Project, Donations from Dominion Energy and Appalachian Power Co., 1196-2018. Former State Sen. John Watkins, “Watkins: Don’t Demonize Virginia Energy,” Nov. 16, 2018. State Corporation Commission, “Combined Reports,” (page 1), April 29, 2018. Email and phone interviews with Brennan Gilmore, executive director of Clean Virginia, Nov. 20, 2018. U.S. Energy and Information Administration, Table T5a, “Residential Average Bill by Census Division and State,” 2017. USA Today, “Here’s Where You’ll Pay the Most for Your Electric Bill,” Aug. 24, 2018. Interview with David Jonas, policy director for Clean Virginia,” Nov. 26, 2018. American Council for an Energy-Efficient Economy, “2017 Utility Energy-Efficiency Scorecard,” June 2017. Editor's Note: A previous audio version of this story mis-stated Dominion's kWh rate as $11.55 instead of $0.1155. It is corrected here.